Barry M Atlantic Road | Light Your Nails! Today I’m showing you a nail polish that comes from the UK. I honestly have no idea how well it’s distributed worldwide, sorry! It’s twice something new for me: first Barry M and first textured polish without any kind of glitter. I love textured glitters, but I’ve never been a fan of those cement-like polishes. 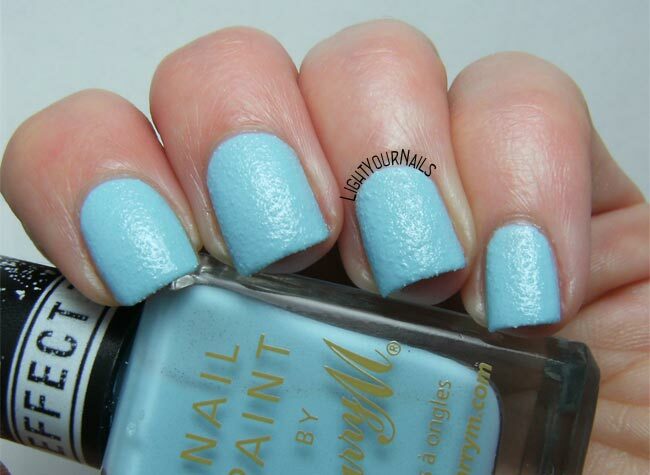 Barry M Atlantic Road is a lovely baby blue that dries rough. Application is easy and drying time fast, which is needed because you can’t use a top coat to help. Coverage is great, this is basically a one-coater. Since you can’t use a top coat though I’d recomment two coats. I must say this nail polish surprised me in a good way. Although I’ve never liked cement-textured nail polish I kept looking at my nails. I was both confused and happy about them. Maybe the colour did the trick? Who knows, but I really liked it! Even my boyfriend was surprised to see a new-on-my-nails finish, and he liked it. What do you think of Barry M Atlantic Road? Are the colour and finish your cup of tea? Davvero? A me gli sugar, che erano quelli coi glitter, erano piaciuti tanto! Scusa se come al solito non pubblico il tuo post, ma come scrivo nel riquadro dei commenti non accetto link. Vero! E soprattutto anche se li ritocchi al volo non si vede differenza!